In addition to recording keystrokes, it will also track the launch of applications, sent emails, visited websites, and save information typed in the forms. The program is simple to install and use. 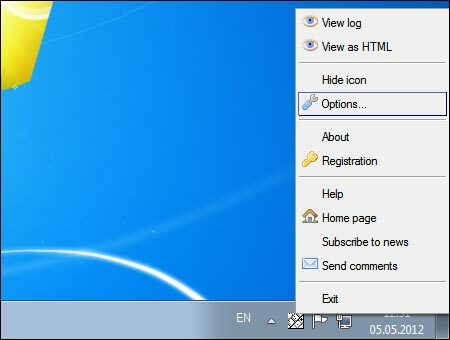 Once installed, it opens to QuickStart window that will instruct you on the main features and on how to use the keylogger. Safeguard your children from online dangers. As the name implies, this keystroke recorder is primarily designed for home use. As a parent concerned about the child's online security, having something like this is a must. The program will tell you about your child's online habits, helping you prevent him or her from visiting adult sites, or making friends with criminals and p-philes hidden behind chat avatars. Catch him or her cheating on you red handed. Chat-rooms and dating websites have made it easier for people to make not only friends, but also have love affairs. Our spy software will help you find out whether or not your girlfriend, boyfriend, wife or husband is cheating on you behind your back when you are not around. Save lost typing instead of re-typing everything from scratch. Another unusual use for our keystroke recorder is saving lost typing. This may be useful when you are typing something in a word processor and suddenly your computer freezes and the application quits for no good reason. With keys logger installed, you'll be able to regain the text you have typed up to the moment when your computer locked up. Monitor your employee's computer activities. Family Keylogger can be used as a form of spy software in the office. As an employer, you'll be able to monitor your employees and identify those who spend corporate bandwidth on shopping, chatting and viewing frivolous content instead of work they are paid. Besides, it can be used to save lost typing in case the computer crashes and an important document you've just created is lost. As the old Russian saying goes "Trust but verify." Indeed, it's better to know about risks in advance rather than to scratch head when something unpleasant already happened. Our software will let you find out the potential dangers before they actually happen. Manoj C., manojc1979(at)hotmail.com: This is best program I ever used and it is great fun to check the logs. I tried on to my system to check the logs of my child and found all the sites and stuff he was accessing thru net and came to know the good and bad things about him. Its really a very nice and easy to use software. Thanx to the creator. Enrique Rochabrunt, South America, erochabrunt(at)mail.ciplima.org.pe: It is an excellent product, very facil to use, intuitive and very discreet. Me it has been of much utility in my work and my home with my smaller children. Honestly I recommend it! This is a great program, i feel confortable knowing what my family is doing, great work!